Preparing for the new semester is easier with the Date Management feature. Date Management will shift all due dates and visibility dates forward according to the Course Start Date or by a number of days you specify. All items with dates are supported by date management including: Content, Assessments, Tools, Grade Columns, and Course and Organization Tasks. From the Control Panel click Date Management under the Course Tools header. 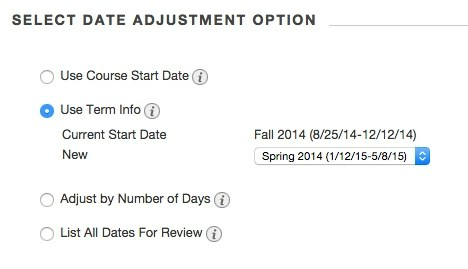 Select one of the four options available to manually adjust the dates or to have Blackboard automatically adjust them. Course Start Date – Enter the original course start date (current semester) and the new start date (next semester). Term – This option will shift the dates forward based on your institution’s term. This option may be hidden if your institution doesn’t use the terms feature. Number of Days – Will shift the dates based on the number of dates specified. List All Dates for Review – Allows you to manually adjust each item. Once the job has been completed the Date Management Review screen will appear. From this page you will allow you to view and edit the adjusted dates. To change the date for one item click the pencil icon to the right and edit the date. Filtering content can be done by using the two dropdown boxes (Content Types and Date Types) at the top of the page. To publish the new dates click the checkbox to the right of the item name or to select all content click the checkbox to the right of the Name header. Once you have selected your specified content click the Adjust Dates button.